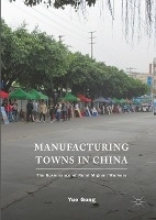 This book offers an engaging and unique view of the governance of Chinese rural migrants in non-factory areas of manufacturing towns. By asking how authorities govern migrants as an ongoing source of cheap labor, this book demonstrates and interprets authorities` power exercised in the form of governing rationalities, regulations, programs, activities, and designated non-factory spaces-town and village centers and migrant living zones. These power exercises take place routinely in migrants` everyday lives but typically veil themselves, producing knowledge that legitimates our understanding of migrants. Based on their power exercises, authorities` governance of migrants, like multiple `invisible filters` that select and help create migrant labor in non-factory areas, leads to an inclusion of a certain number of migrants as cheap factory workers and an exclusion of the rest. Nevertheless, by exercising their unique power techniques, migrants can resist and alter authority governance; thus the authorities` power exercises are deficient and may ultimately be futile. This book details these power exercises, offers rewarding insights, and can greatly enrich our understanding of China`s local governance of migrants and migrant resistance.